Our High Security Cheques incorporate features that provide the highest level of protection in Canada against fraudulent activityand are 100% CPA Compliant. Laser Cheques / Computer Cheques are compatible with any software program. We have the ability to create custom print positions based on your software needs. If you’re like most other business, you are using an accounting program like Sage 50, Quickbooks or AgExpertto print laser cheques for your payroll and payables. There are many advantages to using laser cheques for business and even for personal cheque use. Time savings is a key point to consider when looking at laser cheques compared to manual cheques as when you enter your payroll or payables data into your software program you don’t have to re-enter it anywhere as the software generates and prints all the data directly onto the cheques for you. The software will also keep track of your Employees, and Vendors so you don’t need to manually write that out on each cheque you issue. Another advantage is you will find a reduction in errors on cheques as your much less likely to have typos and wrong amounts that can occur when you write out a cheque by hand. Most of our clients want to use laser cheques due to the time savings advantages I previously mentioned, but many clients also want to use laser cheques as you have an instant record of your cheques being recorded in the software program automatically for you so you don’t need to rely on employees or business owners potentially loosing the cheque stubs, or even worse, not actually taking notes on what cheque was issues for what purchase! Businesses need to have proper bookkeeping measures in place to reduce errors and laser cheques is a great way to improve the accuracy of you bookkeeping. 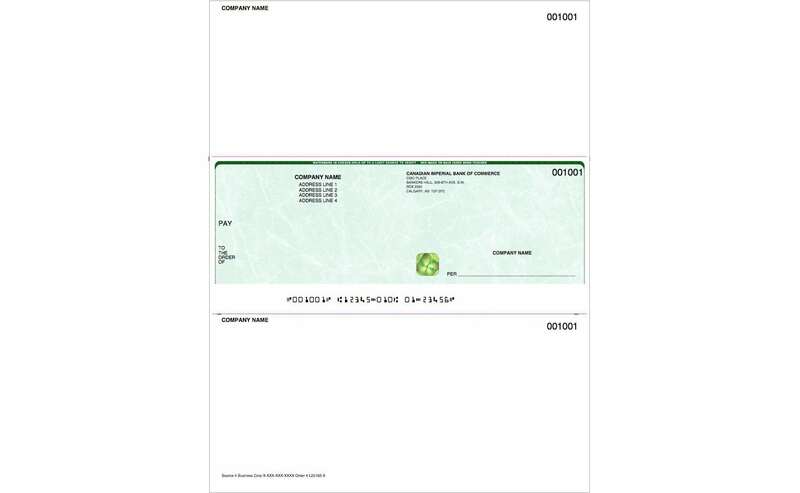 As an actual cheque manufacturing company we are part of a very small number of cheque printers in Canada that have complete control of the production process, and actually get to choose what security features we include when we print the cheques. Some advantages we offer over other suppliers includes the hologram gold foil that we include on our laser cheques. 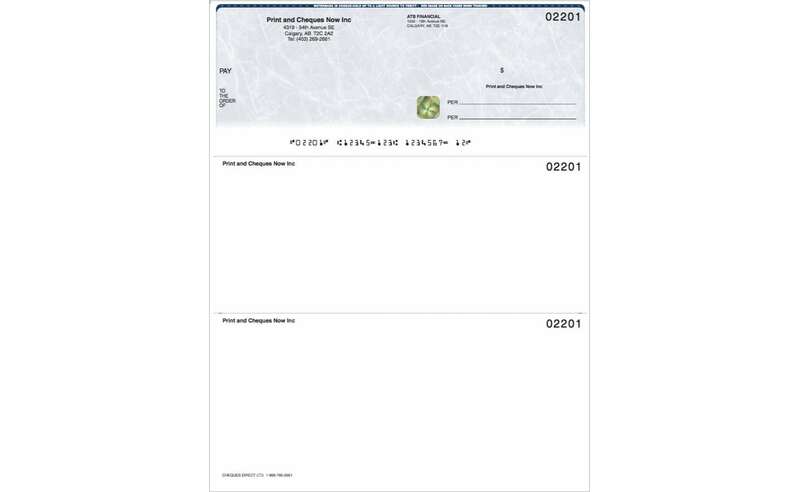 Something worth noting is that the country’s largest cheque manufacturer that prints over 90% of the cheques in Canada recently removed this valuable feature from all of their cheque products. This was simply a step by them to reduce their costs of manufacturing and to increase the profitability on all the orders they receive. As a small family owned and operated printing we value the security of our clients and as such we continue to provide the hologram gold foil at no extra cost. We also decided over 8 years ago to provide all of our laser cheque clients with 25% additional product for Free. This ensures that our clients receive a savings that they wont get from the banks supplier or any other printer. 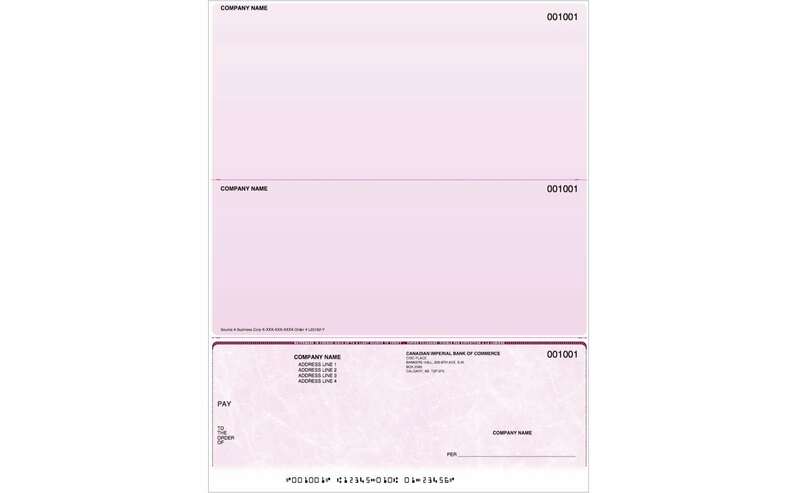 Another security feature we include is a heat sensitive ink that we print on the back of our cheques. This feature like the hologram can not be duplicated by color copiers which helps to reduce cheque fraud. We hope you find some value in supporting a Family Owned company, and we pride ourselves on our commitment to servicing all of our clients needs.